3 Meals Plus Organic Chicken Broth from 1 Chicken! As you may know, I’m all about getting the “biggest bang for your buck”. I’m always looking for ways to make life more efficient; obtain the same results with less effort, so that I have more time to play! 1. Buy a whole, organic chicken (remove the gizzards, neck etc. from the chest cavity and set aside in the fridge). Place the chicken (breast down, spine up) in a roasting pan. Surround the chicken with quartered potatoes, peeled carrots, and peeled, quartered onions (you can also add peeled, cubed squash if you like). 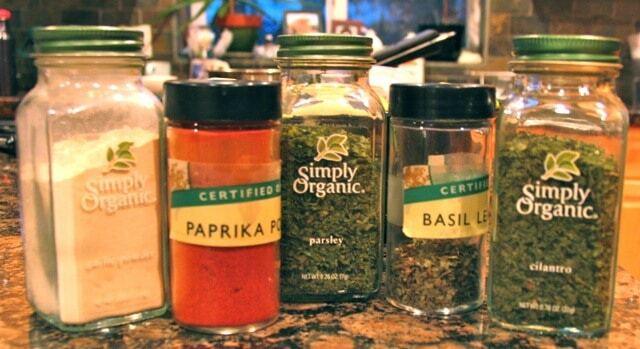 Drizzle olive oil over the top of the chicken and vegetables and then sprinkle the following spices on the chicken: powdered garlic, basil, oregano, hungarian (non-spicy) paprika, powdered ginger (use whichever of these spices you have on hand). 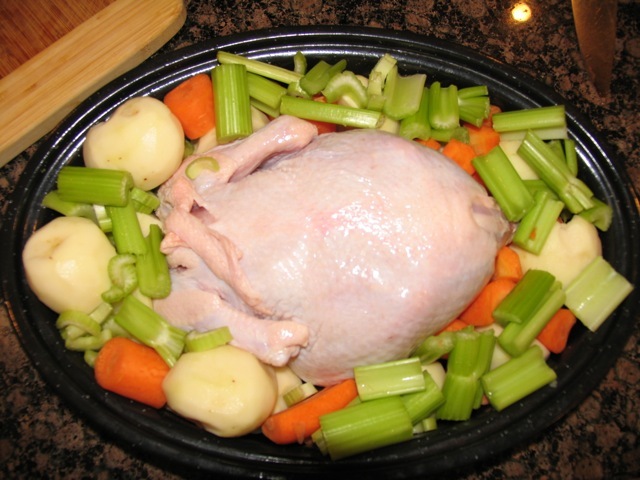 Then put the lid on the roasting pan and put it into a preheated oven at 350 degrees Fahrenheit. 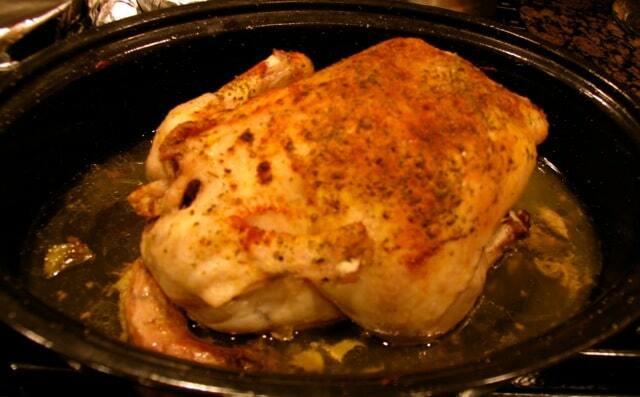 An average size chicken should cook in about 1.5 hours. 2. When the chicken is cooked, remove the lovely roasted chicken and vegetables from the pan and set aside for supper or later – that’s your 1st meal. You can also make a gravy from the drippings left in the pan, if you wish. Cut into chunks ready for use in stews, casseroles, stir-fry or curry. Dice finely and either freeze, or use the next day for Chicken Salad sandwiches (add equal parts yoghurt and cold-pressed mayonnaise to make the chicken salad – serve in sandwiches, or open-faced with raw cheddar melted on top). You see, from one easily cooked chicken (much easier than even pan-frying!) you get at least three meals! 4. Now take all the remaining skin, bones, gristle, and the gizzards and neck you removed initially, and throw them all back in the same roasting pan. Add filtered or spring water to within 2 inches of the top of the pan and 2 tablespoons of Bragg’s Apple Cider Vinegar (or regular vinegar is okay too), and 1 tablespoon of sea salt. If you like, you can throw some veggies in there; a chopped onion, 2 chopped carrots, 2 chopped celery stalks. Put the lid back on and put it back in the oven (still at 350 degrees Farenheit) for at least 2-3 hours (longer if you can leave it – up to six hours). Stir contents and break up softened bones halfway through. 5. Remove pan from oven and throw chicken parts away. Strain the contents of the pan through a sieve into a large bowl underneath the sieve. Place this bowl into your fridge and allow to cool overnight. 6. The next day, use a spoon to scrape the congealed fat off the top of the broth (unless you like to leave some of it in – it’s a good fat) and throw the fat away. Then package up the broth into freezer bags for future use in stews, sauces, soups, etc. If you want to use the broth right away, it is good in the fridge for 3 days. I usually use some right away as chicken noodle soup for the kids – I add diced carrots, some diced chicken meat, 1 bouillon cube and egg noodles – and freeze the rest. Think of all the goodness and body-strengthening nutrients you can get from just one organic chicken! As with all things, the barrier is to just do it once, then it becomes a whole lot easier once you’re familiar with it. I use both HarvestSun and Better Than Bouillon (the organic version). im just wondering why you generally recommend avoiding nightshade veg and spices for symptomatic people but encourage eating potatoes, also a nightshade w a high content of potential irritants like solanine ? Hi Sarah, When you’re doing a meal like this, usually whatever you don’t tolerate (like potatoes, celery, onions, etc.) is enjoyed by other members of the family. If you are just cooking for yourself, then absolutely, just replace with varieties of squash which are often well tolerated. Hi Jini, How good will be Absorb Plus in case of a person with ileostomy, recently diagnosed with Crohn’s disease at ileum’s last section ? Could you use a slow cooker for this instead of the oven? Can I cook the same way in Stainless steel pressure cooker? 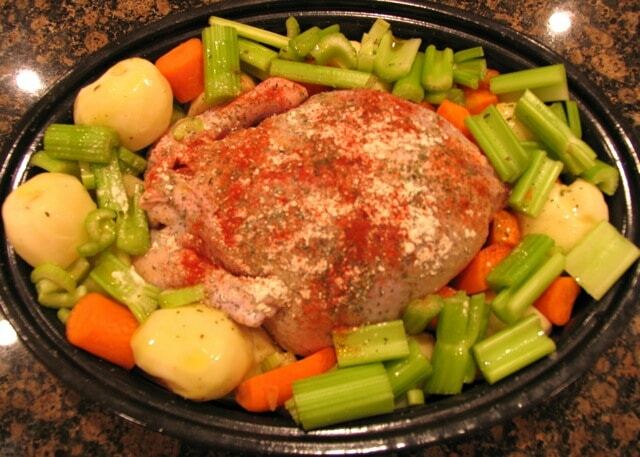 I will cook the whole chicken in the pressure cooker with veggies as you mentioned. What is your thought on this? “I’m a physicist and I understand what pressure cooking does to food. I don’t use it. In physics, temperature and pressure are basically work together to achieve the same result, as higher temperature goes with lower pressure and lower temperature goes with higher pressure. What they both achieve is to break down structures. So, high temperature or high pressure breaks down structures. It is funny to me that people favor pressure cooking because it requires lower temperature. Little do they know that pressure BREAKS DOWN FOODS just like temperature. That is why pressure cooking is fast. I have seen studies and research papers on how pressure changes the food structure and create new chemical bonds that our bodies don’t recognize. Although it is well known that higher temperature destroys vitamin C, yet there are other nutrients that are altered structurally by higher pressure, such as more of the oil soluble vitamins and protein (amino acids). If you understand Physics, you would know temperature and pressure work inversely to achieve the same result, which is to break down structures. If you don’t know Physics, I give you an example that will help you understand this. When people are stressed, their immune system is not working as well. Stress is pressure, which affects us physically and chemically. So either do some more research, or just listen to your gut!